The embargo has just been lifted, so after three weeks of waiting, here are a selection of PES 2013 reviews and impressions taken from the lucky members who attended last month's early hands-on at Konami's press tour in Brazil. "As usual, Konami's presenting its PES 2013 additions in the form of three pillars: Full Control (PES FC), Advanced AI and Player ID. These were mentioned earlier this year in the form of a press release, and we have to admit we weren't exactly blown away. How wrong we were. "The slower pace, combined with the great PES FC additions, makes for a more tactical, skilful game, which not only shakes off last year's image as 'the arcade footy title' but, according to some FIFA-loving journos on our trip, might seriously be enough to see them switch allegiance this year." "Holding down the tackle button harries an opposition player, holding up the play - while double-tapping the same button sends the player lunging in pursuit of the ball, a challenge that won't necessarily work out, that outcome made more likely by the more advanced close control that's afforded to attacking players." "The Player ID stuff looked amazing as well, especially with Ronaldo. All his movements in the game look wonderful. The way he runs, dribbles, shoots, passes etc all look extremely lifelike, and bodes well for the other players who are lucky enough to have this treatment." "We all remember the extreme lack of skill of the keepers in PES 2012. It seems that the PES Team have not been deaf and has worked hard to provide a response to the rise to the occasion, with an increase in the number of animations included." Talking about Player ID: "Ronaldo, Messi, Kaka, Robben, Iniesta, Neymar, Xavi, Ribery, Puyol and Terry, even with his famous diving header, were shown in sequence in real movies and gaming. We do not yet know the total number of players who will enjoy this "treatment" but we hope that it's as many as possible." 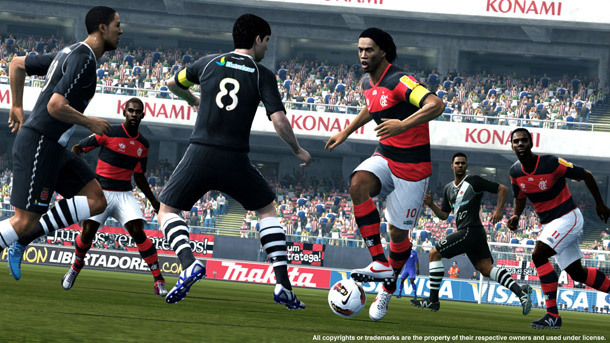 "The goalkeepers, a longtime complaint of PES fans, had special attention. Many animations have been added, in addition to improved artificial intelligence of the goalkeepers. "Defending Response gives greater control over the steals. Pressing X twice, and your player will try to catch the ball, regardless of where it is." "It is fair to say that the manual passing and shooting require some training by the player who must again absorb a whole series of new commands. "The production team revealed that they are working on a way to banish the cheats - or anything else malicious let a player win matches illegally."